“Happiness is….yoga on the beach! The word itself has almost become a cliché, its ‘essence’ wrangled over by everyone from sociologists to poets as if to define it might somehow be to achieve it. To find it, like the Holy Grail, and then grasp it and keep hold of it, like a rare flower or a precious gem, something to be both protected and coveted. All of these ideas feel wrong to me, or if not wrong then at least unhelpful. 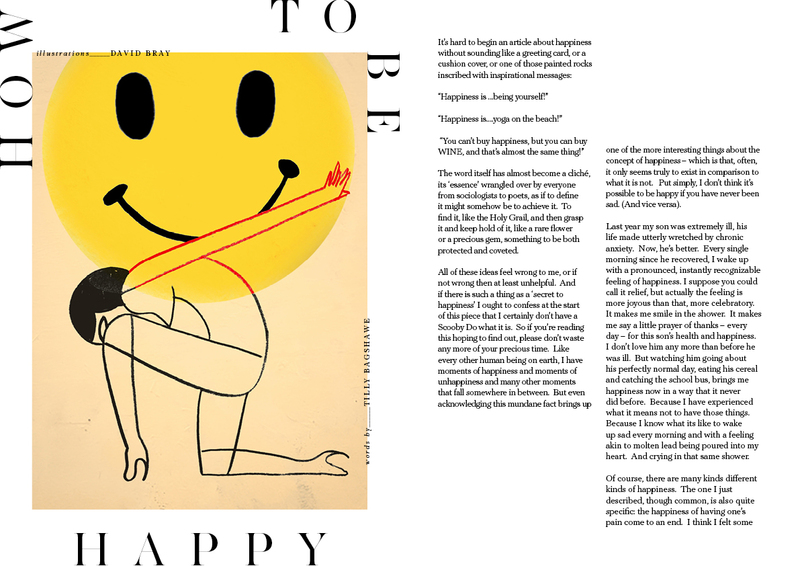 And if there is such a thing as a ‘secret to happiness’ I ought to confess at the start of this piece that I certainly don’t have a Scooby Do what it is. So if you’re reading this hoping to find out, please don’t waste any more of your precious time. Like every other human being on earth, I have moments of happiness and moments of unhappiness and many other moments that fall somewhere in between. But even acknowledging this mundane fact brings up one of the more interesting things about the concept of happiness – which is that, often, it only seems truly to exist in comparison to what it is not. Put simply, I don’t think it’s possible to be happy if you have never been sad. (And vice versa). Last year my son was extremely ill, his life made utterly wretched by chronic anxiety. Now, he’s better. Every single morning since he recovered, I wake up with a pronounced, instantly recognizable feeling of happiness. I suppose you could call it relief, but actually, the feeling is more joyous than that, more celebratory. It makes me smile in the shower. It makes me say a little prayer of thanks – every day – for this son’s health and happiness. I don’t love him any more than before he was ill. But watching him going about his perfectly normal day, eating his cereal and catching the school bus, brings me happiness now in a way that it never did before. Because I have experienced what it means not to have those things. Because I know what its like to wake up sad every morning and with a feeling akin to molten lead being poured into my heart. And crying in that same shower. Of course, there are many kinds of different kinds of happiness. The one I just described, though common, is also quite specific: the happiness of having one’s pain come to an end. I think I felt some version of this in my late teens when I finally recovered from first romantic heartbreak. (Surely the only thing more wonderful than falling in love is falling out of love with someone who has already fallen out of love with you? Waking up and realizing that the torture and agony is over and that your heart is once more your own, whole and free?) The happiness of leaving a miserable job, of getting out of debt, of getting pregnant after years of failed IVF – clearly, none of this would be possible without the unhappiness that preceded it. But the concept of happiness is so vast, it equally clearly cannot be limited to this simple equation alone. The word also incorporates joy and excitement, the fleeting rush of winning a gold medal or being proposed to by the man of your dreams. Then again, it can also mean contentment, which if you think about it is almost the exact opposite: that precious, calm, warm, feeling of rightness. Ecstasy’s low-key cousin, contentment is the reliable, unsexy happiness, the one that lingers. The older I get, the more into it I am. It’s marriage versus an affair. Flip-flops versus six-inch heels. It’s Cornwall versus Ibiza. Being a parent is all about contentment. You’re ‘happy’ your children exist (hopefully). But at the same time, in any given moment, having a mimosa by the pool with a girlfriend makes you considerably ‘happier’ than listening to your son bang on about Pokémon. Sorry. It just does. Which brings me neatly to my final point about happiness being about ‘living in the present’ something I hear a lot these days, especially here in LA. Like so much about this paradoxical word, this seems to me to be both true and untrue. It’s true, because when we slow down and notice and appreciate the small, immediate things, like how great a piece of chocolate tastes right now, or how cheerful those daffodils look by the side of the road – we feel better. Happier. But it’s untrue because surely so much human happiness is either anticipated or remembered? Precious childhood memories (for me, trying to stay awake for Father Christmas on a snowy Christmas Eve in my grandmother’s cottage, aged five; unquestionably one of the happiest moments of my life) – or the prospect of a summer holiday, dreamed about on a rainy March day – these things by definition take us out of the present. But wouldn’t all of our lives be sadder without them? Forget “Life, Liberty and the Pursuit of Happiness.” It seems to me that you only need to ‘pursue’ things that are running away from you. Happiness, like Dorothy’s ruby slippers, is there all along. You might not always realize it – but that’s OK too. Life is supposed to be messy. So don’t worry. Be Happy.